In skateboarding vernacular, Switch Stance refers to riding the opposite direction than usual, in the opposite stance, and making it look normal. For example, a regular-foot skater riding goofy is riding switch, or a goofy-foot skater riding regular is riding switch. If the skateboarder's feet are set for going one way, and he or she ends up riding the other way, that is called "Fakie". It's different, in that the back foot is usually on the tail, and when riding Fakie it will often be on the nose. Can the same be applied to photographers? You can take switch pictures if you have two cameras that shoot at the same time. It can be done either with a remote control but can also be done fortuitously. 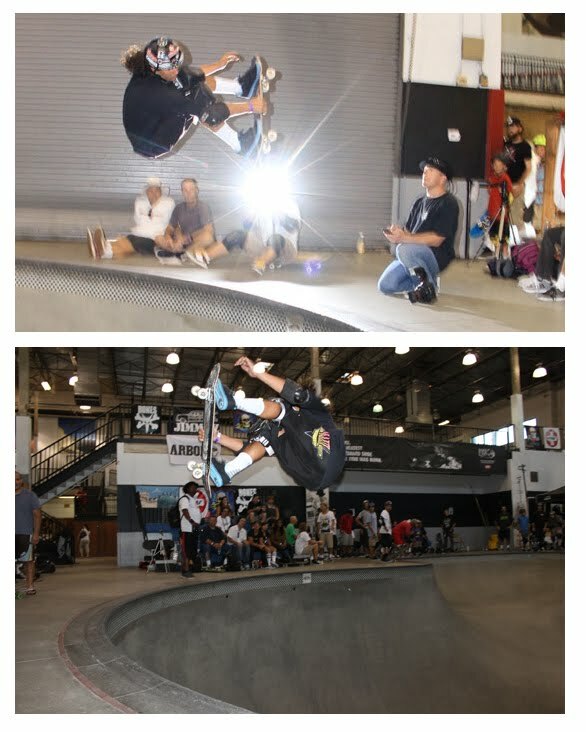 When I was at the OG Skate Jam #4 at Vans, I took tons of pictures. Most of the time, we are 4, 6, 10 photographers to shoot the same picture at the same moment. But because I take my pix at 1/200, even if I shoot at the same time as another photographer, we are never in-sync. Always too early or too late by 1/200 of a second…. So when I peered over Antonio Thronn’s blog today, I realized that for once, our pix were truly in-sync. Even with thousands of pictures taken by a handful of photographers, that never happens… Really!!! And, yes, I am the photographer sited on a skateboard. That’s how I use my skate: I sit on it… LOL! !